The astonishing landscape of the planet Mars could force a reevaluation of all popular ideas about the planet. Yet even its most “improbable” geology finds a unified explanation in the electric discharge hypothesis. From the first glimpses of the Martian surface, the planet revealed one paradox after another. Images of Mars did not fit the textbook picture of a cold and inactive rock ever-so-slowly peppered by random impacts. Planetary scientists responded by applying two assumptions, both of them formulated long before the space age began and long before the onrush of new evidence pointing to electricity’s influence on galactic, stellar, and planetary evolution. They assumed that Mars has moved on a stable orbit for billions of years. And they assumed that present geologic processes on Earth are the key to understanding Martian history. Both assumptions must now be abandoned because new discoveries contradict them. But it is unlikely that planetary scientists will see the evidence until they stop projecting prior theoretical models onto Mars and give adequate attention to the detailed images, now in hand, that simply do not fit traditional preconceptions. Another view of Mars is possible, and its contrast with popular ideas about Mars could not be starker. The new vantage point arises from a convergence of scientific and historical investigation. Two individuals who have helped to lead the way in this are David Talbott and Wallace Thornhill, co-authors of Thunderbolts of the Gods. Both were inspired decades ago by the work of Immanuel Velikovsky, author of the 1950 bestseller Worlds in Collision. Talbott was the founder and publisher of the ten-issue groundbreaking series, “Immanuel Velikovsky Reconsidered,” in 1972. He later authored a book, The Saturn Myth (Doubleday, 1980), proposing a “catastrophist” approach to world mythology. As early as the 1960s, Australian physicist Thornhill, following the lead of Velikovsky (and later Velikovsky’s close colleague Ralph Juergens), began a lifelong investigation of electricity in the cosmos. Talbott and Thornhill first met and talked for several hours at an international conference on Velikovsky’s work in 1974. For years after that meeting they pursued their investigations separately, each largely unaware of the other’s work. Then, in 1997, they began a collaborative approach in concert with many other contributors, some of whom are included as editors of these pages. From pole to pole, the surface of the planet has been sculpted by electric discharge. The picture above was returned by the Mariner 4 probe as it approached Mars in 1965. 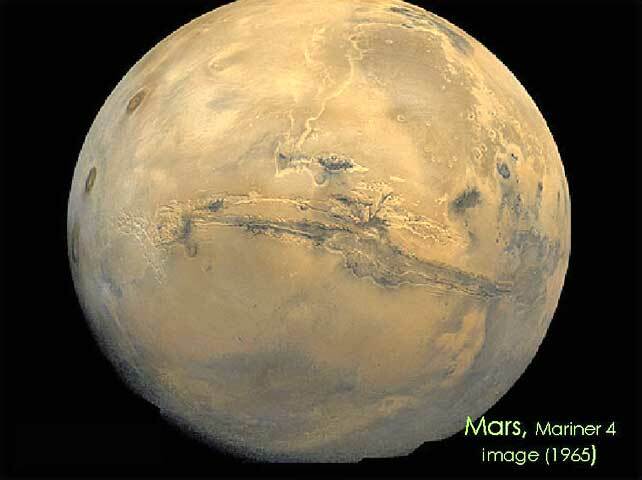 It shows Valles Marineris, a giant trench more than 3000 miles in length. What event cut this monstrous chasm on Mars? Planetary scientists first thought water erosion was the agent, but that interpretation collapsed in the face of higher resolution images. Now some speak of surface spreading and rifting. But here, too, one need only examine pictures closely to exclude the interpretation. The defining features show no surface spreading. Detailed close-ups show that the force creating the chasm scooped out and removed the material—a fact clearly evident along the neatly machined “tributaries” all the way up to their rounded terminations. The result of the event was a continental scale trench equivalent to hundreds of Grand Canyons. Every textbook on Mars will tell you that Olympus Mons, a giant mound dwarfing Mount Everest, is a “shield volcano”. And no doubt that interpretation seemed obvious when NASA scientists received the first images of the towering formation. —all are diagnostic of a single phenomenon: an electric discharge impinging on an anode, or positively charged surface. The fundamental structure of Olympus Mons can be replicated in the laboratory. Of course, the phrase “electric discharge” has yet to enter the lexicon of Martian geology—or astronomy for that matter. Fundamental shifts in theoretical perspective do not come quickly. But one advantage of the electrical interpretation is that its implications are both sweeping and testable. The electric theorists claim that all of the primary patterns of Martian geography are replicable by electric discharge. In contrast, they argue, close inspection of the planet’s surface features will, in every significant case, refute NASA’s contrived and often contradictory “explanations”. In introducing the “planet of a thousand mysteries,” we have discussed craters in the lab and cratering patterns on Mars, Martian dust devils global dust storms on Mars, Martian “Blueberries” in the lab, analogs of these “concretions” on Earth, and—on a much larger scale—analogous domed craters on Mars. But these few glimpses do not begin to tell the larger story of the Red Planet. A unified portrait of Mars is possible. Only a fundamental change in vantage point is required.